The 1970s were turbulent times in the UK, as workers moved on the offensive against employers and the government, winning big improvements to pay and conditions and even bringing governments down. In 1975, this unrest even spread to usually one of the most conservative sections of the workforce: doctors. However, while junior doctors took industrial action to resist unfair changes to their pay and conditions, consultants took action to protect their ability to make private profits on the back of their paid NHS work. In January 1975, NHS consultants withdrew "goodwill" and worked to rule in protest against proposed new contracts which would force them to abandon private practice. Three months later they called off the action when the government agreed to let part-time consultants continue private practice. They then took further action, refusing to undertake any duties other than emergencies, when the government moved to phase private practice out of NHS hospitals. They suspended the action when the government agreed to pass the proposals to an independent board. In November 1975, junior doctors who already were underworked and overpaid, began industrial action over new contracts with inferior pay and conditions. Doctors worked to a 40 hour week and dealt with emergencies only until agreement was reached on the contracts with the government the following month. The 70s witnessed most NHS staff taking industrial action, the NHS turmoil reflecting political drama across Europe and America: massive opposition to war in Vietnam, a general strike in France, miners' strikes in 1972 and 1974 that toppled the Tory government, the rise of feminism (demands for equal pay and the right to personal control over fertility) and an economic crisis and IMF loan demanding public sector cuts (sound familiar?). When porters, cleaners and other "ancillary workers" struck against low wages in 1972, the atmosphere of the time encouraged some of us as medical students to join their picket. 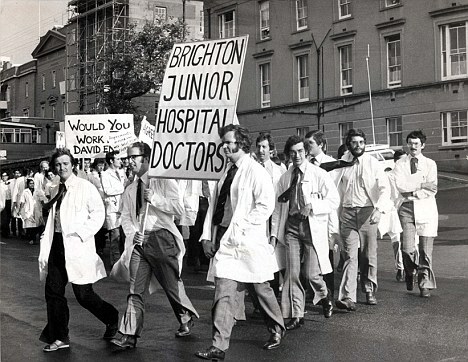 More medical students and doctors, many now members of the Medical Practitioners' Union, supported nurses' and radiographers' action in 1974. Their action was fuelled by confidence gained from the women's movement. In January 1975 consultants took action against Barbara Castle outlawing the treatment of private patients in NHS hospitals. The policy emanated from the ancillary workers' strike about low wages, but staff also wanted to end consultants treating private patients, for which they alone were paid, using NHS staff and equipment. The NHS of the day had separate dining rooms for consultants (waitress service) and a canteen for the rest of NHS staff. Later that year junior doctors took action against the following problems: rotas that enforced working 120 hours one week and 80 the next while being paid for a 40-hour week; appalling conditions in their on-call rooms; and having to provide care for "their" consultants' private patients, which took them away from NHS commitments. Juniors found they had more in common with ancillary staff than their consultant bosses. NHS staff learned that they were "part of the union" and that other workers would rally to support them. During the nurses' dispute we approached shop stewards at the Sun who then refused to print an anti-nurse headline in the next day's addition. There was blank space where the nurses' story should have been. The incoming Labour government's attempts to solve the ongoing economic crisis resulted in an IMF bailout, which, as usual, was coupled to public sector cuts. With inflation high, public sector workers were hurting. Grave diggers and "dustmen" (refuse collectors would be the more correct term these days) joined the wave of public sector strikes and "the winter of discontent" ushered the Labour government out and the Thatcher era in. The ancillary workers' strike of 1972 sparked three years of NHS militancy, improving wages and reminding governments of the importance of the NHS to the public and their objection to private practice being parasitic on the NHS. The prevailing mood then was of an unjust war and an economic crisis with workers, especially in the public sector, feeling pushed into action. On the efficacy of the action, it is sometimes commented in the press that hospital death rates declined during the doctors' industrial action. This is probably accurate (although month by month figures to confirm are unavailable), however it does not mean industrial action was ineffective as doctors continued to provide emergency and life-saving treatments, but elective surgeries were postponed. And with all surgery there are risks: so deaths related to elective surgery procedures will have been substantially reduced during the period of industrial action. In 2015, junior doctors are once again considering industrial action as the government prepares to attack their pay and conditions further.